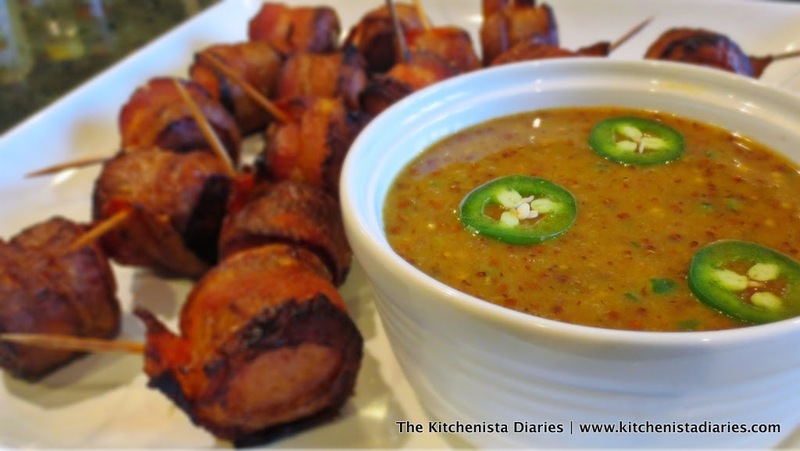 A few blog posts ago I promised my readers I'd get back to cooking with bacon after my vegetarian recipe binge. 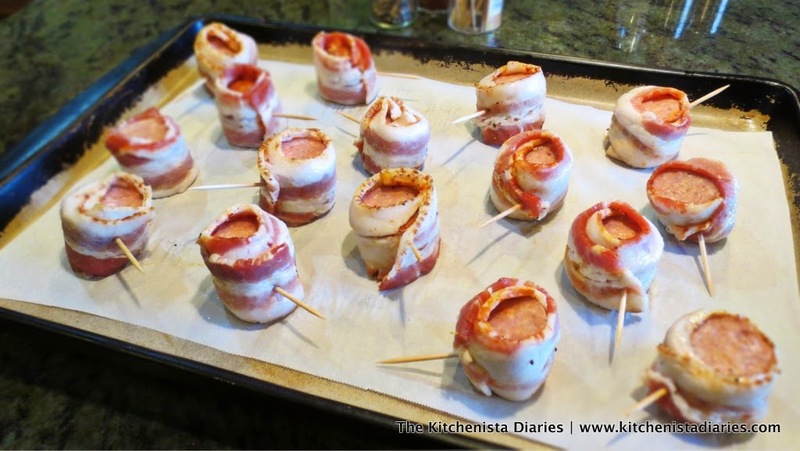 Well, I'm excited to share a recipe that definitely delivers not only the bacon, but bacon wrapped sausage! Does it really get better than that? When Johnsonville Sausage asked me to create a summertime recipe, I couldn't resist doubling up on the pork in this fun appetizer. You may recall that I used Johnsonville's Split Rope Andouille Sausage in my Cajun Mac & Cheese recipe, one of my most popular posts to date! This time, I chose to work with their Polish Kielbasa Split Rope Sausage because it's reminiscent of the kind of sausages my dad often put on the grill for our family barbecues. 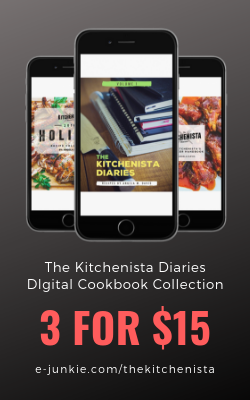 These babies are packed with flavor using only premium cuts of pork, and unlike most other fully cooked sausages, Johnsonville uses absolutely no fillers for a juicy and firm texture and bite. So why hide all that real flavor in a bun? 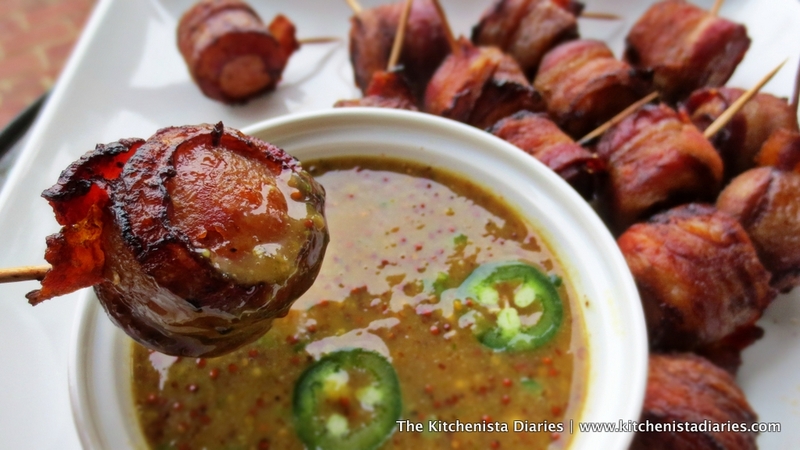 I wanted to let the Polish Kielbasa speak for itself, so I simply wrapped it in bacon and made a complementary spicy honey mustard sauce for dipping. 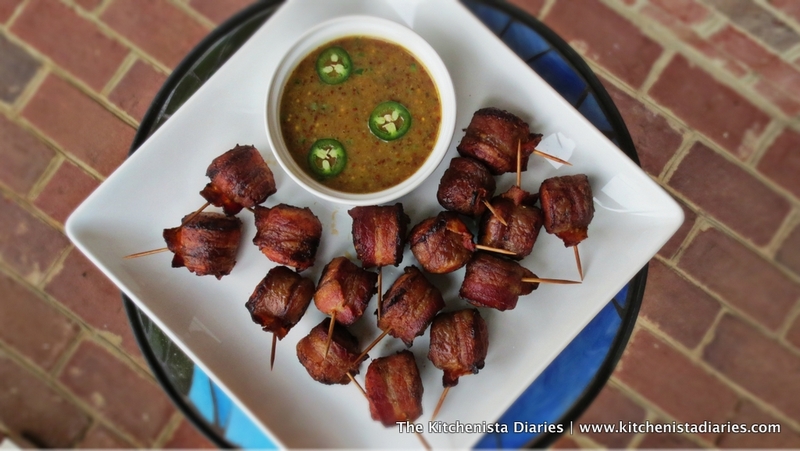 This is an incredibly easy, crowd pleasing appetizer that can be prepped ahead of time. That's exactly the kind of break I need when I'm hosting an outdoor party! Summer barbecues at our house are almost always out back, where my dad handles most of the grilling while the kids get some time in the pool. 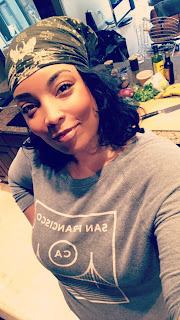 I tend to be in the kitchen preparing side dishes and dessert, and my mom helps out by greeting our guests and making sure things run smoothly. Because there's always a bit of time to kill until it's time to eat, I love the idea of having an appetizer ready when people start arriving! It's always nice to get a little bite of something with your beer or cocktail no matter where you happen to be. 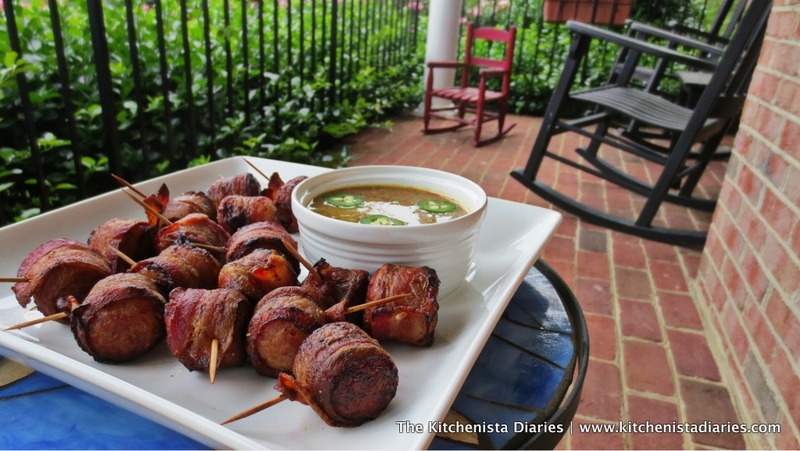 My recipe makes eight appetizer servings, or two Bacon Wrapped Kielbasa Bites per person. If you're just cooking for two, like I often am, the nice thing about Johnsonville's Split Rope Sausage is that it offers portion control packaging with two individually-wrapped sausages. Preheat your oven to 400°F. Begin by slicing both Split Rope Sausage links into 8 bite size pieces. To do this evenly, I just cut each link in half, then into quarters, and finally into eighths. 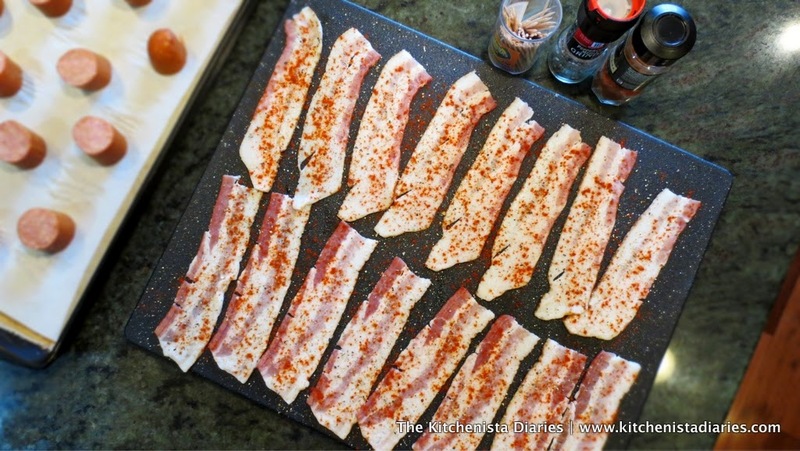 Lay out the halved bacon strips and season each one with a pinch of smoked paprika and cracked black pepper. 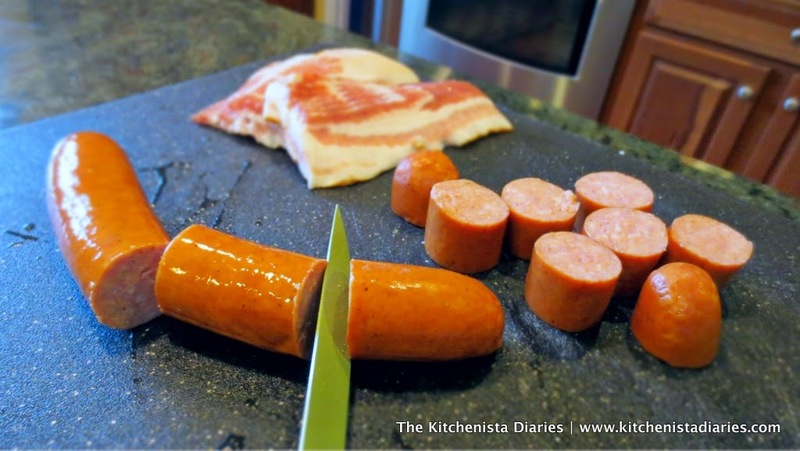 Place a Kielbasa piece casing side down at the end of the bacon, and roll forward to wrap it. 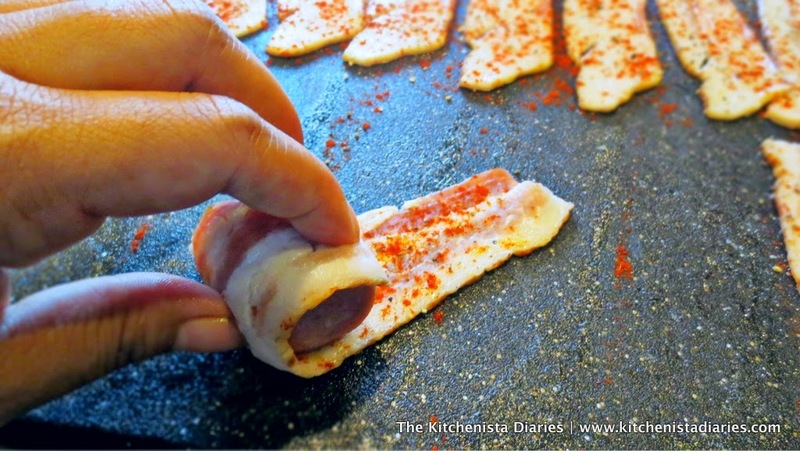 Use a toothpick to secure the end of bacon. 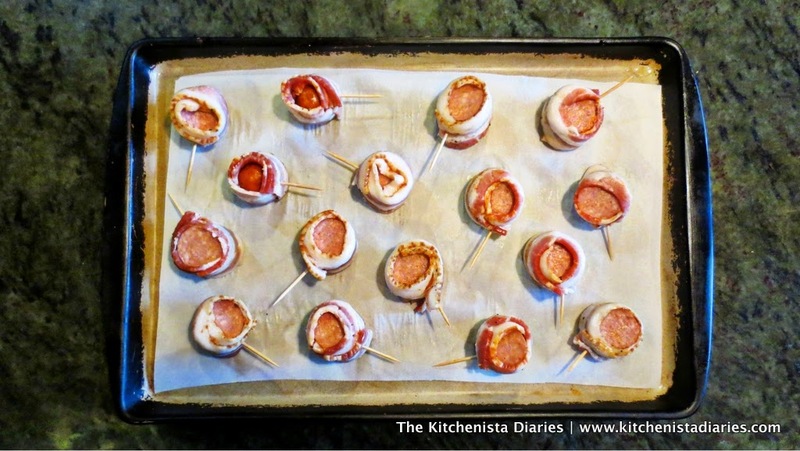 Arrange the Bacon Wrapped Kielbasa Bites on a parchment lined baking sheet. 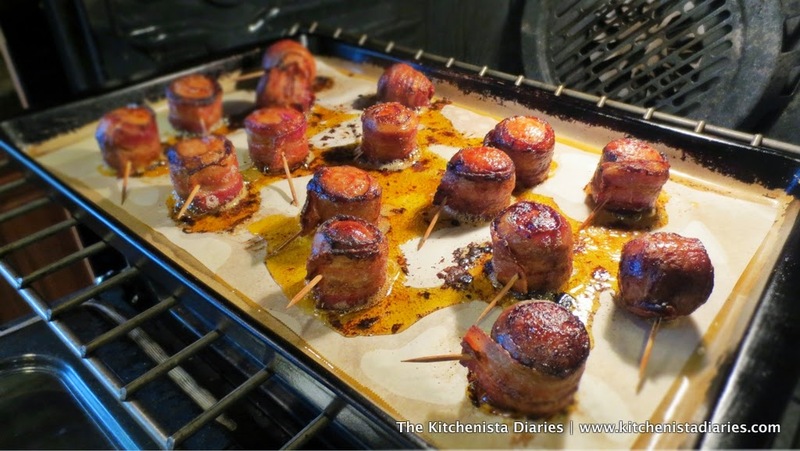 If you place them standing up as shown, the bacon will cook more evenly and crisp all the way around. If you're making these ahead of time, cover the baking sheet with plastic wrap and chill until needed. When ready to cook, uncover and transfer the baking sheet to a preheated oven. Bake at 350°F until the bacon is crispy and browned, about 20 minutes. Halfway through cooking, turn them over so that the bottom gets crispy as well. 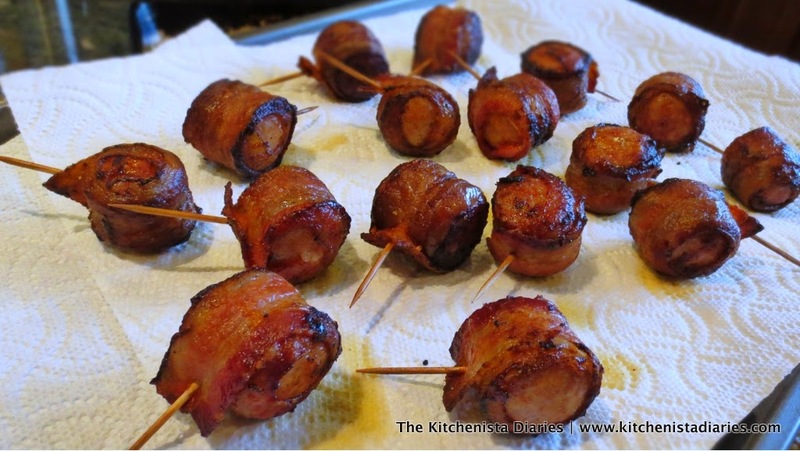 Transfer the cooked Bacon Wrapped Kielbasa Bites to paper towels for a couple minutes to absorb excess grease prior to serving. Resist the urge to steal one now! My only motivation for not taking a bite here was that it was obvious I started with exactly 16 pieces! I absolutely love how the Polish Kielbasa caramelizes a little bit around the edges as it cooks. Combined with the crispy bacon and that hint of smokiness from the paprika, this is one delicious bite. The sauce takes just a few minutes to prepare and can be made well in advance. 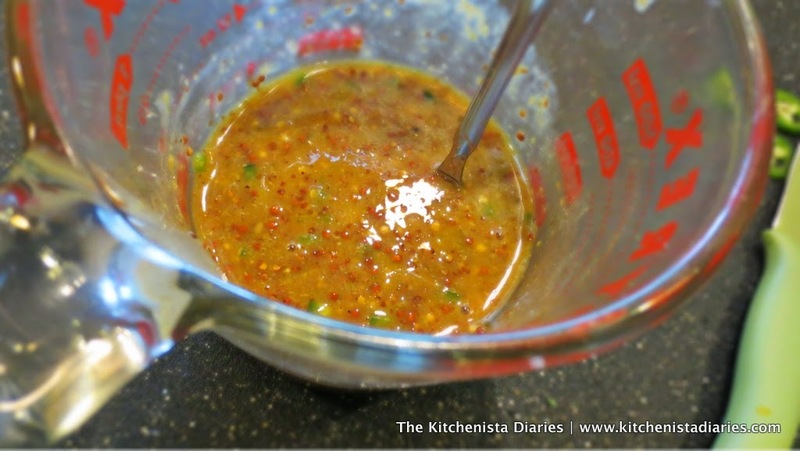 Just combine the honey, mustard, grated shallot, chopped jalapeño, lime juice, lime zest, and about 1/2 teaspoon of smoked paprika. When I'm not using a food processor to make a sauce, a microplane really comes in handy for grating ingredients like onions, garlic and shallots. It turns the shallot into a paste that is easily stirred into the sauce instead of worrying about trying to mince it into tiny pieces. You should control the spiciness of the honey mustard sauce based on who you're serving it to, so it's up to you whether to include the seeds or not. I wanted a milder sauce that my son could enjoy, so I removed the core and seeds before chopping it up. I reserved a few slices to use as a garnish later. Stir all the ingredients together and season to taste with a pinch of salt and pepper if needed. I used half whole grain mustard for some texture, but if you like a smoother sauce just use double the amount of dijon mustard instead. Most honey mustard sauces also contain mayo for creaminess, but I like to avoid that when planning to leave a dish sitting outside. Instead, this sauce is more like a vinaigrette. As a bonus, any leftovers could be used to dress salads or as a condiment for burgers and hot dogs! 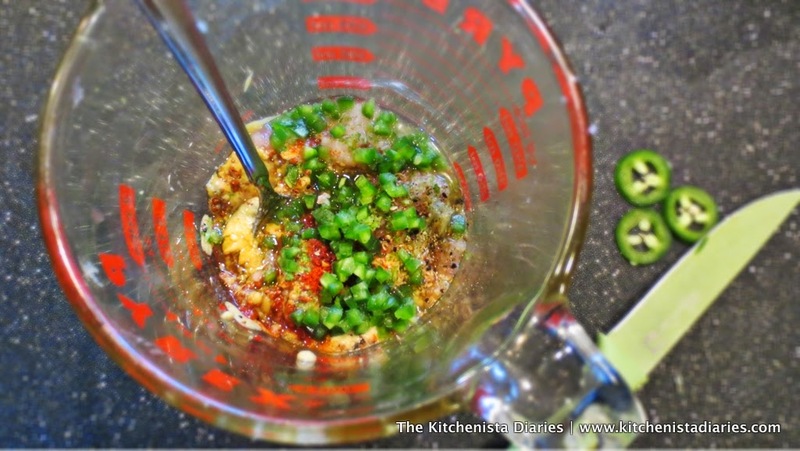 Pour the prepared Jalapeño Honey Mustard Sauce into a serving dish and garnish with the reserved jalapeño slices. It's always a good idea to use garnishes as a way to tell your guests what's in the dish, no surprises! Serve hot or at room temperature. I won't tell if you double dip! Johnsonville has been served with pride since 1945. 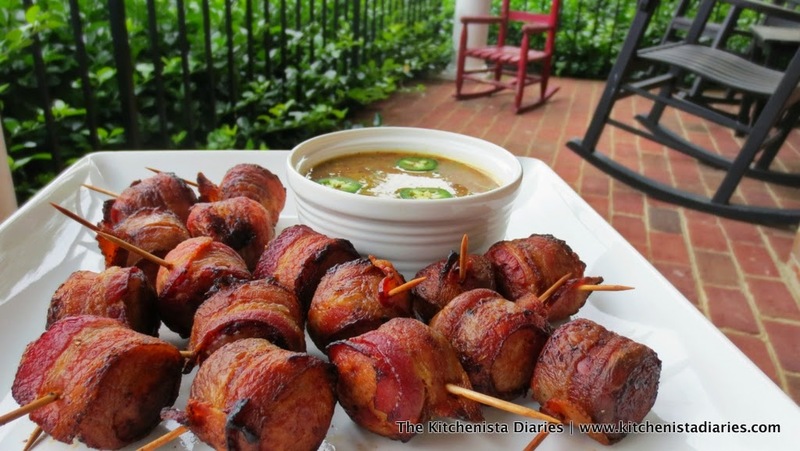 I hope you enjoy these Bacon Wrapped Kielbasa Bites as part of your family's summertime traditions for years to come! 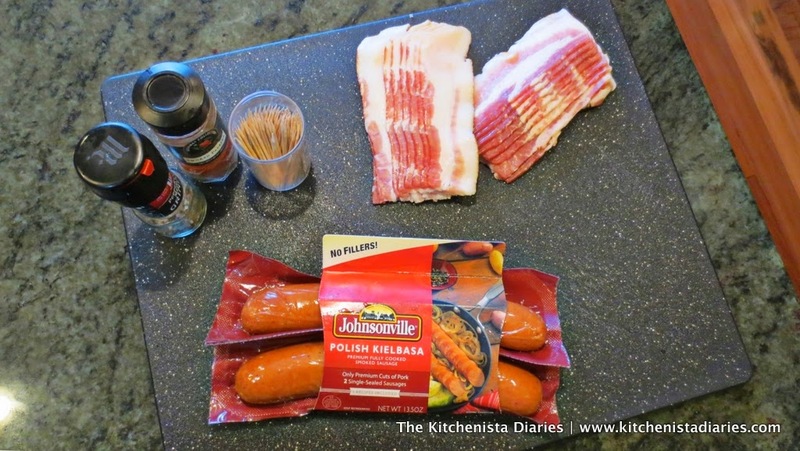 This blog post was sponsored by Johnsonville Sausage. All views and opinions expressed here are my own. Preheat oven to 400 then bake at 350? or preheat oven to 350? It's minor, I know.